Woodland Trails Bed and Breakfast is located in Pine County on the Wisconsin border, 23 miles east of Hinckley, Minnesota and just four miles from Danbury, Wisconsin. 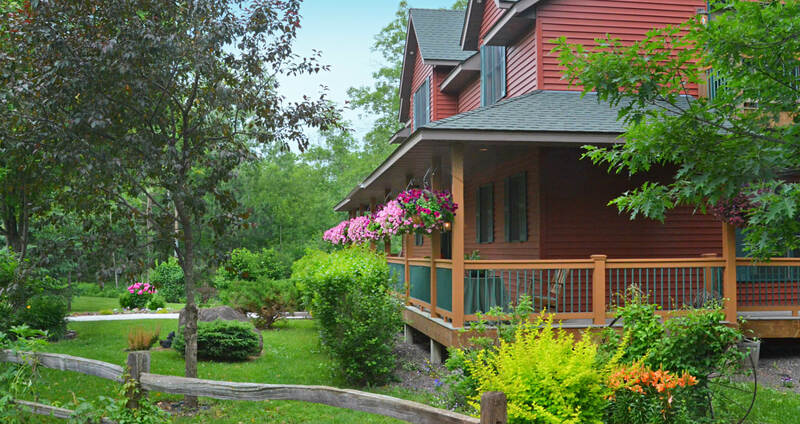 Our rustic, yet modern, country inn is a welcome change from typical hotel lodging. Our quiet accommodations are also convenient to local attractions, such as concerts and casinos in Hinckley and Danbury. For a relaxing, romantic Minnesota getaway, we are less than two hours from the Twin Cities, St. Cloud or Eau Claire WI and just over an hour from Duluth/Superior. Nearby cities include Spooner, Siren & Webster, WI. For GPS Enthusiasts, our coordinates are: N 46 01.335′ and W 092 26.789′. Take I-35-E or -W north. At Hinckley, take MN Hwy 48 east for 23 miles, to the St. Croix River. Turn left (north) on Grace Lake Road, the last possible turn before the river. Woodland Trails is just a half mile up the road. Take WI Hwy 35 south out of Superior. At Danbury, take WI Hwy 77 west 4 miles to the St. Croix River. Just after crossing the St. Croix, turn right on Grace Lake Road. Woodland Trails is just a half mile up the road. Take Hwy 23 to Hinckley. From Hinckley take Hwy 48 east for 23 miles, to the St. Croix River. Turn left (north) on Grace Lake Road, the last possible turn before the river. Woodland Trails is just a half mile up the road. Take WI Hwy 77 west 4 miles to the St. Croix River. Just after crossing the St. Croix turn right on Grace Lake Road. Woodland Trails is just a half mile up the road. Take I-35 to the Twin Cities, then follow either the Scenic Route below or Fast Route above from the Twin Cities to Woodland Trails. Take MN Hwy 36 east to Stillwater. If you have time, stop and browse through the downtown shops. For lunch we like Whitey’s at 302 Main Street. From Stillwater take MN 95 (Main Street) north 24 miles to U.S. Hwy 8. At Hwy 8 turn right (east) and follow it through Taylors Falls and over the St. Croix River to St. Croix Falls. Almost immediately after crossing the St. Croix take WI Hwy 87 north (left) 27 miles to Grantsburg. At the junction of Hwy 87 and 70, continue straight ahead. You will take a winding route through Grantsburg to the north end of town where you will find signs to Crex Meadows Wildlife Area and Burnett County Road F. On your way through Grantsburg, look for yellow geese painted on the roadway. Many of the geese are faded and hard to see but those at the corners have been repainted. From the start of County Road F at Crex Meadows check your odometer. Follow County Road F north for 24 miles. At WI Hwy 77, turn left (west). Cross the St. Croix River. Immediately after crossing the river, turn right (north) on Grace Lake Road. We are just 1/2 mile up the road.